I’m not sure whether to love or hate author Jean Reidy. You see, she has given my daughter a whole new vocabulary for why the clothes that I pick out for her are not quite right. Like many two or three-year-olds, my daughter can be a little choosy about what she wears. Yes, I limit the choices but that doesn’t stop her taking off what ‘we’ decided on and appearing five minutes later in something entirely unsuitable for the day’s activities or weather forecast. 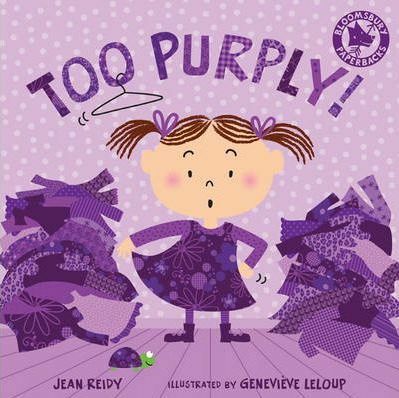 This is perhaps why she loves Too Purply by Jean Reidy so much. Reidy captures one little girl’s standoff with her wardrobe to perfection. Regardless of what is suggested it is either “Too stichy”, “Too polka dotty”, “Too baggy” and so on. Favourite pages in my house are “Too fancy” and “Too dancey” although the first time we read it my daughter did look a little perplexed – how can anything be TOO fancy or TOO dancey?! Much of the charm of Too Purply is in the fantastic illustrations by Genevieve Leloup – apart from the wonderful use of colour and background designs it is the facial expressions of the little girl and her patient, but perhaps long-suffering sidekick, a pet turtle that I really like – the look of horror on the turtle’s face on the overly floral “Too matchy” page is priceless, as is his dark sunglasses on the “Too stripy” page and lipsticked pout for “Too fancy”. Ultimately the heroine chooses something that is comfortable – “So comfy! Just right.” I like the fact that her selected outfit looks practical (a fantastic role model given that I am often pressing the point that tulle alone will not really be warm enough on a winter’s morning in Melbourne). This is a great book for preschoolers – rhyming text and the fab illustrations are a winning, page-turning combination. I await Reidy’s second book, Too Pickley, with anticipation and trepidation. Due to be released in July, Too Pickley tackles the trials and tribulations of the picky eater and I suspect will give my daughter a whole new vocabulary for avoiding broccoli! Too Purply is available from Fishpond for $9.97.